I love riding my Brompton in Barcelona and other places when we travel. In fact I’ve taken it with me all over Europe since it’s so easy to travel with it, whether it’s by plane, train or car. It’s a great means of transport, but it’s also true that if you live in hilly regions it can be a challenge to use it on a daily basis as a means of transport. The same thing applies if you’re not that young anymore and don’t have the same energy and stamina as before. Enter electric bikes. They’re not a new concept but recent advances in battery size and capacity as well as electric motors have really made possible and driven the market for electric bikes. The official electric Brompton is now a reality and is already being sold in the UK, albeit at quite a high price. There are however several alternatives that don’t require you buying a new bike but just convert your existing one. In this post I’ll summarize the options available, and continue updating it with new developments as they happen. I have a 6 speed Brompton that is love to convert, but I’m not fully convinced by any of the current solutions. It also seems that every year there are some significant advances in this technology and so I’m hesitant to make a significant investment now just to see something much better come out next year. So without further ado, here are the current options. I’d love to hear from others who have already purchased such kits or the official electric Brompton and hear about their experience. In 2017, an Official Brompton Electric bike was finally released. In my opinion this is a very disappointing effort, especially given all the years it’s been in development and the hype about it being co-developed with Williams F1. I’m not surprised that it’s taking longer than expected to have it available in stores around Europe. 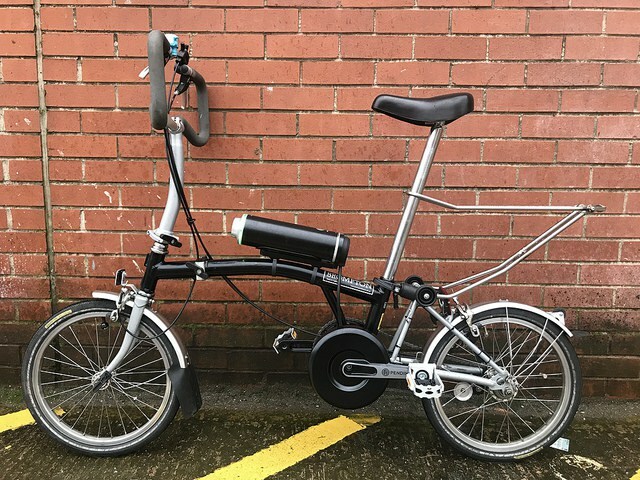 This started out as a Kickstarter project for regular bikes, but it is now available for many types of bikes including the Brompton. The Swytch Brompton Electric conversion kit probably the most affordable one available at the moment and you can also install it yourself if you have some know-how. This is arguably the best solution out there at the moment. It costs €1,700 and has been developed by Electric Concepts in Tel Aviv, Israel. I like this one a lot since there are no wires involved, and the power is delivered from the rear wheel. Check it out on their website. The Pendix electric assist kit is a very neat German-made system – it’s a crank drive kit, but unlike most crank drives, it can be fitted to conventional frames with no modification. The battery fits to a holder that fits to the bottle bosses or other convenient mounting points. A simple control knob on the battery sets the power output, and that’s it – it’s beautifully simple. Because of this, it’s perfectly suited to bikes with hub gears, recumbents or any bikes where a hub motor won’t fit. Since it is a crank drive, it will work on any Brompton – no need to change brakes, wheels or gearing, no frame modifications are needed. What are your thoughts on the electric Brompton? Would you buy an electric conversion kit for your Brompton? hi jean! any news of any reasonable and working kit for a brompton? As you can see there are several options now, although in my opinion it’s still early days. The official one is too expensive for my tastes (given that it is fairly new technology that will likely be superseded soon) and the Spanish version has a very long waiting list. Has anyone figured out how to travel on an airplane in Europe with a 300Wh ebike? I think this is forrbidden, the max is 160Wh. I don’t want to be on the airplane on which a 300Wh battery goes off. Have you contacted Brompton about it or asked in one of the Facebook Brompton groups? Let us know if you find the answer, I’m also interested in this as I travel frequently with it. I googled te issue. There is now an official policy by all airlines that limits Li batteries to 160Wh. Batteries >160 Wh are now part of the list of dangerous goods that you can’t take with you at all. All ebike manufacurers know this. This is not only for people carrying planes, they also can’t ship batteries with cargo planes easily any more – there have been several dangerous battery explosions. At the moment nobody has an idea how to deal with the issue. Interesting, well that’s a sad situation. I guess I’ll have to continue traveling by train and car as I’ve been doing lately. I’m fed up with security crap at the airports anyway. HI – we are at nanoelectricbikes.co.uk. We have been fitting electric conversion systems to Bromptons for over 10 years. You can see on our website that we offer 4Ah batteries which mean you can take them on a plane. They give a range of 8 – 16 miles (12-25km) so perfect for the majority of journeys and as the batteries are only just over 1kg each you can always carry a second if you want to go on a longer trip. What’s the top speed and how does it compare to the official solution? The Zehus is very smart, but you loose the gears, and having the battery in the hub means it is close to impossible to ever change the battery, The Spanish solution is barely available and the primitive cadence disc is not convincing at all. The Brompton measures cadence and torque, and this works really well. I like the front wheel solution as I still have gears for faster speed. And there is no significant resistance when riding without electric support. One could criticise that torque is measured on the left pedal – bad for a right-handed cyclist. You need half a round of pedalling before it kicks in at a traffic light. One could also criticise the external battery, but this has an advabtage for charging off the bike. The response is very good and it looks nice. Maybe the Gocycle is sexier, it looks very smart, but then the Brompton folds properly, without the need of an any tools – a huge plus. I think Brompton Williams did a great job, and I will post here my experienced after having done some few hundred miles. Is the cadence disc the only thing that concerns you in the Spanish solution? There isn’t that much to an ebike, a motor and some control and when it is to go or not. What makes the difference is weight, size and control. If you don’t have cadence it just goes when you move the pedal. With torque you add a whole level of control and feels much better, and the Brompton soution feels really smooth. The small bike that has all this right is the gocycle, but they lack the fold. Right, so what you are saying is that out of all these options the official one is the most advanced solution to come out yet. The native Brompton is certainly more advanced than the add-ons. What it lacks so far is the software that gives you all the information about power distribution and additional control (have a look how gocycle does this). But this has been announced, at least for iOS. The Brompton hub also has a clutch, this is why it has no extra resistance when it is off. Not sure whteher the others have this. A simple test shows you how sophisticated they are. If you liift the native Bromton ebike and start to pedal almost nothing happens with the front wheel, because you have no torque on the pedal. This is why it pulls smothly, and the transition to pure muscular power above 25km/h is also very smooth. Thanks Ulrich, that is very helpful. I’m going to wait a few more months before I make the investment to make sure nothing better comes out. Thanks, not much info on their site unfortunately. This looks like one of these cheap and simple but working solutions. Manual controls with a pedal cadence sensor (which is required in the EU). To add a torque sensor you need a lot of software. You say above you have taken your Brompton all over Europe. How do you get the battery onto an airplane? They don’t allow batteries above 160Wh. I don’t have an electric version yet so I was referring to the traditional one. Why do you think the electric concepts hub is better than the Brompton solution. It costs nearly the same, has half the battery capacity, you loose the gears which desperately need when the battery is empty, and changing the battery is a majour repair. I did buy the native Brompton. Drives like a charm, all promises I read about the performance are justified but front hub is broken after a few miles (makes clunking noises). Customer support is good though, they respond immediately, and I have 27 out of 30 days left to return it. Do you have an opinion on the add-e Sportskit kit for Brompton ? No I had not heard of that one till now. Have you seen it in action? Nope. But its very light, Can be removed in seconds, and their Next edition coming soon will be all wireless exctpt pne cable. Only down thing seems to be the wheel roll and i am a bit concerned abour durability on such a small motor. Interesting, there’s lots of development happening at the moment so I am waiting until a real leader emerges before ordering my own kit. I’ll probably get a new bike at that point as I quite fancy the idea of having one manual bike and the other with the kit.